1082 results. Displaying results 21 - 40. 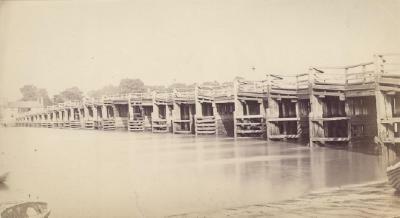 'Putney Bridge' - Sepia photograph of the old wooden bridge over the River Thames at Putney. It was replaced in 1886 by a five arched stone bridge that still stands today. Photographed by Henry Taunt c1870. From a collection of views along the River Thames photographed by Henry Taunt. Henry Taunt was born in Oxford in 1842 and rose from poverty to establish himself as an extremely successful and skilled photographer. His work has created a unique photographic record of Victorian life. 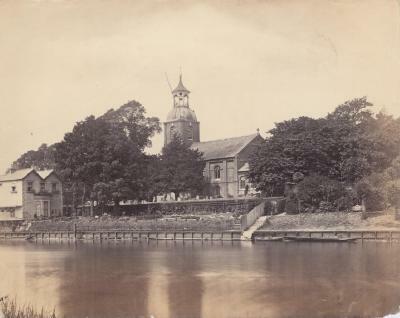 'Henley on Thames' - Sepia photograph view of Henley Bridge and St Mary's Church. Photographed by Henry Taunt c1870. 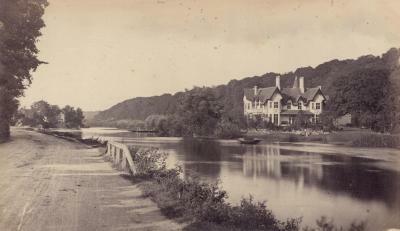 From a collection of views along the River Thames photographed by Henry Taunt. Henry Taunt was born in Oxford in 1842 and rose from poverty to establish himself as an extremely successful and skilled photographer. His work has created a unique photographic record of Victorian life. 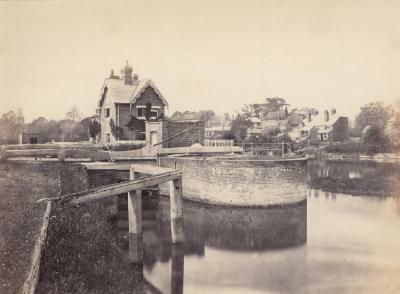 'Whitchurch' - Sepia photograph of Whitchurch Lock and Whitchurch Bridge over the River Thames. Photographed by Henry Taunt c1870. From a collection of views along the River Thames photographed by Henry Taunt. Henry Taunt was born in Oxford in 1842 and rose from poverty to establish himself as an extremely successful and skilled photographer. His work has created a unique photographic record of Victorian life. 'Mapledurham Lock from below' - Sepia photograph of Mapledurham Lock on the River Thames. Photographed by Henry Taunt c1870. 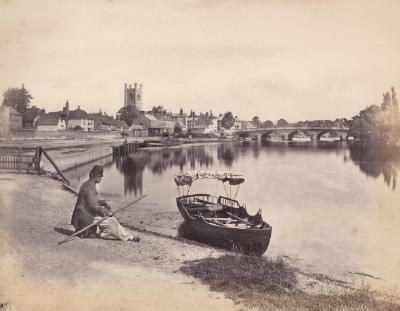 From a collection of views along the River Thames photographed by Henry Taunt. Henry Taunt was born in Oxford in 1842 and rose from poverty to establish himself as an extremely successful and skilled photographer. His work has created a unique photographic record of Victorian life. 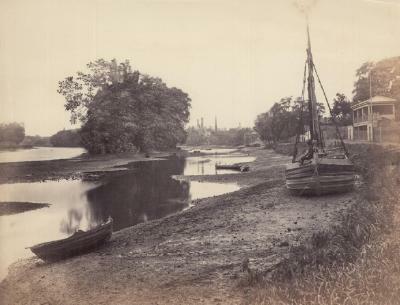 'View at Ray Mead or Glen Island' - Sepia photograph of the River Thames at Ray Mead or Glen Island. Photographed by Henry Taunt c1870. From a collection of views along the River Thames photographed by Henry Taunt. Henry Taunt was born in Oxford in 1842 and rose from poverty to establish himself as an extremely successful and skilled photographer. His work has created a unique photographic record of Victorian life. 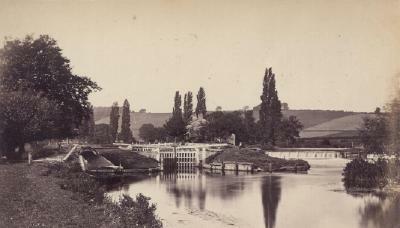 'Sunbury Lock, Thames' - Sepia photograph of the lock on the River Thames at Sunbury. Photographed by Henry Taunt c1870. From a collection of views along the River Thames photographed by Henry Taunt. Henry Taunt was born in Oxford in 1842 and rose from poverty to establish himself as an extremely successful and skilled photographer. His work has created a unique photographic record of Victorian life. 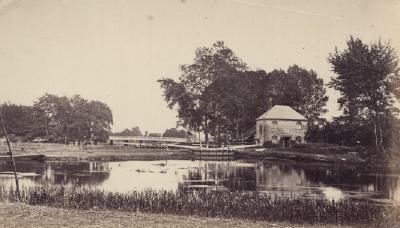 'Sunbury Chapel' - Sepia photograph of the chapel beside the River Thames at Sunbury. Photographed by Henry Taunt c1870. From a collection of views along the River Thames photographed by Henry Taunt. Henry Taunt was born in Oxford in 1842 and rose from poverty to establish himself as an extremely successful and skilled photographer. His work has created a unique photographic record of Victorian life. 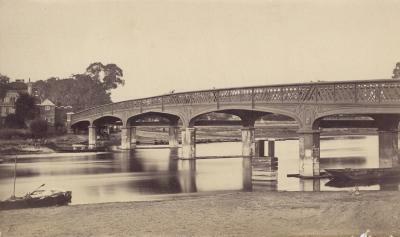 'Hampton Court Bridge' - Sepia photograph of bridge across the River Thames at Hampton. Photographed by Henry Taunt c1870. From a collection of views along the River Thames photographed by Henry Taunt. Henry Taunt was born in Oxford in 1842 and rose from poverty to establish himself as an extremely successful and skilled photographer. His work has created a unique photographic record of Victorian life. 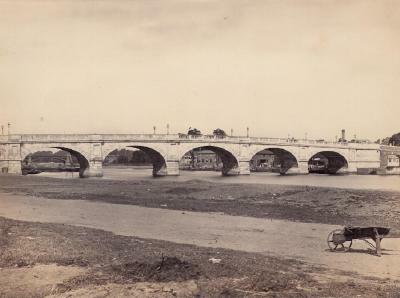 'Kingston Bridge' - Sepia photograph of the bridge over the River Thames at Kingston. Photographed by Henry Taunt c1870. From a collection of views along the River Thames photographed by Henry Taunt. Henry Taunt was born in Oxford in 1842 and rose from poverty to establish himself as an extremely successful and skilled photographer. His work has created a unique photographic record of Victorian life. 'Brentford' - Sepia photograph of the River Thames at Brentford. Photographed by Henry Taunt c1870. From a collection of views along the River Thames photographed by Henry Taunt. Henry Taunt was born in Oxford in 1842 and rose from poverty to establish himself as an extremely successful and skilled photographer. His work has created a unique photographic record of Victorian life.